Click the map to zoom in and then click and drag to move around Bristol. Your bowser needs to have a Flash Payer plugin. Alternatively view the map as a large jpeg file (1 mb). You can also download a large hi-resolution file (4.6 mb jpeg file). 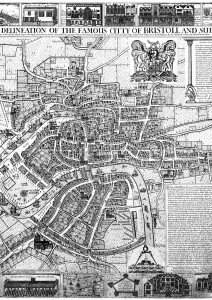 Explore 17th Century Bristol with Bristol Radical History's version of Millerd's map of Bristol from 1673.